Rain is falling today. The cat feels the change in temperature, and meows restlessly at the door. The snow is melting. The gutters are rife with slush and garbage. The clouds press close to the pavement, hugging the curves of the road and nestling into the valleys. We spent the morning in the car, driving to the capitol check out a used pickup truck DH has been eyeing. Right now weâ€™re a one-car family, but with the house closing coming up in a couple of days weâ€™re going to start needing a truck to haul drywall and refuse. It makes sense up here, where the snow falls often in the winter and our driveway is long, to be able to plow it ourselves or haul wood. Growing up my, my dad always had a truck. It was a 1969 Ford Ranger Camper Series Pickup with a long bed and a stick shift that was connected to the steering wheel. The seats were maroon, and the steering wheel wrapped with leather. 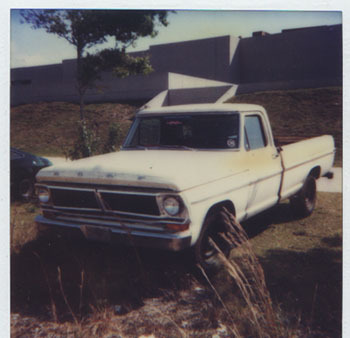 I learned to drive in that truckâ€”and steering it felt like maneuvering a boat. Whichever way you turned the wheel, ever-so-slightly, the whole truck went. In the winter weâ€™d put concrete blocks in the back to improve traction. My father was already sick when he sold it, though at the time he was still in denial about having cancer. â€œReally?â€ I said with a smile, remembering countless adventures in the truck my mother had nick-named Bessie. â€œItâ€™s true,â€ I said. Then waited, as his pain interrupted us, and his voice grew taught and shallow. â€œThatâ€™s all I can do now,â€ he said. The truck we looked at today is also a Ford. Dark red, with all the plushness of modernity: power lock windows, airbags, antilock breaks. We make a plan to come back to haggle over the price after we've research its blue book costs, and then drive back along the rain-slick highway. I notice a lone crow on the high branches of a bare tree. The road is often obscured with fog. I grow pensive. Right now my life is abundant with firsts. Each day Bean makes another discovery: yesterday he took his first wild wobbling steps towards me away from the couch heâ€™d been holding on to. Now there is a lump in my throat and I catch myself wondering what it is like to be at the end of oneâ€™s life, to have each day filled with lasts. I wonder if my father thought about the last time he drove. About the last time he walked. And then there were those days where each time he awoke, he must have contemplated the awe of waking, and wondered when he would not. It always catches me off guard when I find memories of my father occupying my mind in the vivid way that they are today. Iâ€™ve grown used to not having him around, and recently my life has been so abundant with other things I donâ€™t stop to contemplate the emptiness I sometimes feel. Even in great sorrow your eyes are like a pair of darting bluebirds, across a stormy summer sky. Two bright flecks of all that has come before and will return, to the eternal clockwork of the earth. Right now you seem like the edges of a lake in early spring, ice turning black and hollow waiting for the shuddering crush of a turtleâ€™s first foot print; the rising of water levels; the tug of vernal currents; life that surely follows winterâ€™s shallow death.